Health Administration Offices at Veteran Hospital, VA Long Beach Healthcare Center, Long Beach, CA. Architectural/Engineering design services to renovate 20,000 square feet of existing space used for Health Information Management Systems (HIMS), Release of Information (ROI), Health Administrative Services (HAS), Emergency Operation Center, ADA restrooms, and corridors. The spaces included private offices, cubicles for staff, conference rooms, moveable file storage in medical chart room, break rooms and copy rooms. Design a new Air Handler Unit to serve the entire basement area, duct distribution system, VAV boxes, fire/smoke dampers and tie to existing Metasys DDC controls. Design of architectural finishes, fire rated walls, doors, hardware, flooring, ceilings, LED electrical lights, mechanical ducts/diffusers, low voltage, etc. Design of new fire sprinkler lines and heads and tie to existing main lines. Design of new fire alarm devices with wiring to tie in to existing fire alarm panels. Design new communication lines, new physical access control system and tie to existing systems. Design modular furniture systems. Anatomical Pathology Lab at Veteran Hospital, VA Long Beach Healthcare Center, Long Beach, CA. Architectural/Engineering design services to renovate 17,200 square feet of existing for Phlebotomy, Histology, Cytology, Grossing Area, Accessioning and Special Procedures. The project included full abatement of asbestos containing material in existing flooring in corridors and other areas per hazardous material test report. Design of new interior partitions, ceilings, flooring, finishes, associated mechanical, plumbing, and electrical fire sprinkler, fire alarm systems required for a complete installation. Design of relocation and reinstallation of medical equipment. Morgue Renovation for Family Access, VA Long Beach Healthcare Center, Long Beach, CA. 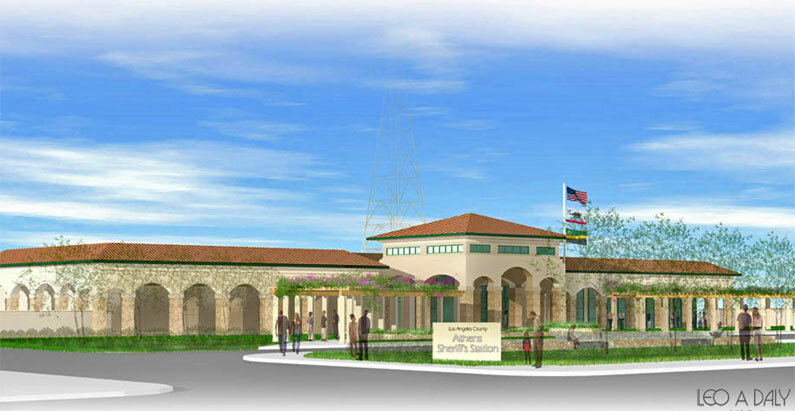 Architectural/Engineering design services to renovate 5,500 square feet of existing space used for autopsies and reconfigured existing storage space for viewing and a reception area for the families. Upgraded the HVAC and exhaust system, controls, electrical system, plumbing, refrigeration, flooring, ceiling tiles as well as painting, finishes, IT, cameras, fire protection, security and controls. Redesigned administrative functions for documentation of incoming or outgoing bodies report writing, receiving, preparation and temporary storage of bodies. Designed family and police viewing and identification of bodies. Designed ADA restrooms for staff with lockers and showers. Designed areas for bodies to be held in refrigeration until autopsy is performed. Designed separate entrance for the delivery of bodies and for visiting relatives. The delivery of bodies was screened from view of patients and public. The waiting room was designed as a serene and non-institutional type with dimmable light fixtures in the viewing room. Designed ventilation systems to prevent the entry of odors from the other parts of the facility. Anatomical Pathology Lab (Clinical Lab III), VA San Diego, CA. Architectural design services to renovate Clinical Lab Phase III at VA San Diego Medical Center include Microbiology with BSL 3 Lab, Flow Cytometry, Phlebotomy and administrative offices. The design provides Lab Furniture; exhaust hoods etc. for operational comfort of the staff. We designed counter surfaces which are easy clean for infection control. Designed Blood Draw area with patient comfort in mind. We provided blood draw stations that accommodate bariatric patients. We created calming environment to put patients at ease in Blood Draw Waiting Room.We designed Biosafety Level 3 (BSL3) lab for Microbiology with Primary and Secondary barriers to protect the persons working in the Lab. We designed Ante Room and special ventilation systems.We designed the Flow Cytometry with Oncology Diagnostics, Walk-in refrigerator and Lab Equipment keeping in mind the operational flow of the functional space. Architectural design services include replacing all antiquated windows in a 5-story Building & a 3-story Building at the VA Long Beach Healthcare Center, Long Beach, California. The existing windows contain lead paint and asbestos containing materials (ACM) which are carefully identified and addressed in our construction documents. This project will restore the building security, stop the on-going rain damages, air drafts, heat gains and losses by providing new Low-E insulated glazing windows with integral blinds, security grills and repair/fix all adjacent and interior areas affected by exterior window renovation. The result will improve conditions to equal or better than original in multiple locations. Our design services also include coordination with VA for different window systems such as the use of operable and fixed windows at different areas. Additional scope of work include new structural details and calculations for the new roof anchors to support future window washing capabilities and new painting scheme of entire exterior of Building 1 & 2. Working drawings and specifications are completed for all phases and cost estimate including separate breakout of deductive alternates to help VA and the Director of the facilities to exercise the options desired. Phasing plan is carefully studied and developed with VA input to minimize any operational interruption and suggestion for infection control to the facilities during construction. Project Size: 15,000 Square Feet Window Replacement, 72 Units of Roof Anchors. Architectural design services include expanding the existing Electro Physiology Laboratory (EP Lab) on the 4th floor of the VA San Diego Healthcare Center, San Diego, California. The existing EP Lab was determined to be undersized for the procedures that are completed. Our scope of work include re-design of existing EP lab to meet new “Hybrid Lab” design criteria by expanding existing room with existing imaging equipment to be protected in place. The imaging equipment’s computer/ electrical Room will be relocated. Provided a re-designed Scrub Room and new in-ceiling equipment such new anesthesia boom, new equipment boom, LED surgical light and related connections. We also provided upgraded Heating, Ventilating and Air Conditioning (HVAC) system to meet current VA standards. Other scope of work include installing new signal systems and data and communication wiring, upgrading of air handling unit serving the zone including all terminal units and HVAC piping, ductwork. Provided interior design services for new area with finishes based on appearance; wear ability, etc and incorporated principle of Planetree model in the design and finish selection. Existing asbestos in interstitial space and other hazardous materials such as existing lead walls are carefully identified and addressed by our design team. Sustainable building materials and design concept such as LED lighting, ceiling tile and flooring with high recycle contents and low VOC paint are used throughout the project. Architectural Design Services to renovate Spinal Cord Injury Building and Radiation Therapy Building with new interior finishes and redesigned the reception area. Incorporated principles of Planetree model of patient-centered care design for the lighting and finish selection resulting in distinctly warm, nurturing and healing environment. Designed concealed LED light cove to create a comfortable, indirect illumination in the lobby/waiting area and patient corridor. Designed curvilinear ceiling soffit and flooring with accent colors to create a vibrant feeling of the space. 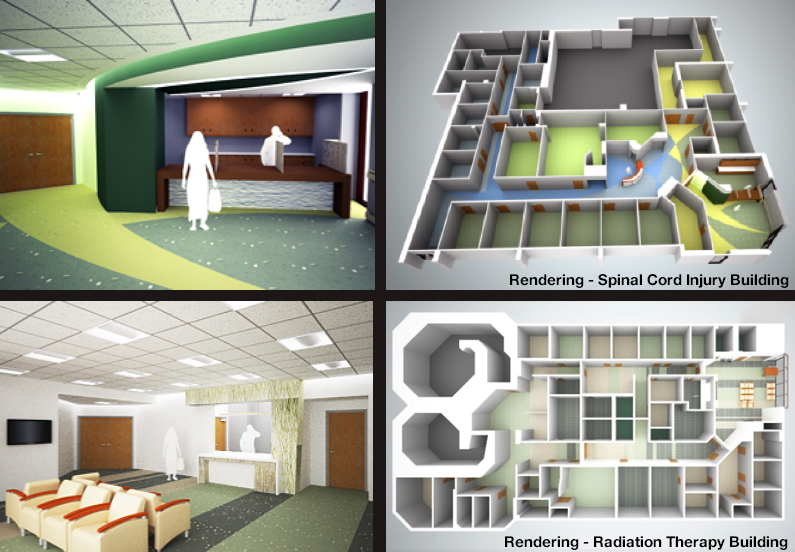 Created a better visual flow form lobby to patient rooms by incorporating different floor patterns and use of lighting effect. 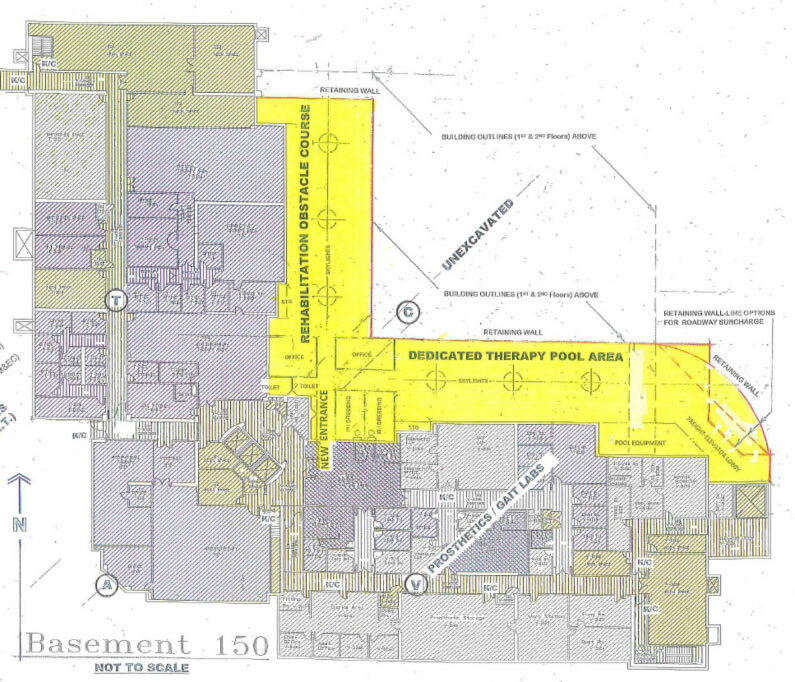 Designed covered walkway from North Entrance of the Main Hospital to proposed Cancer Center. The design included glass canopies on steel support system with color changing LED lighting. The glass canopy would glow at night with spectrum of colors and make it an interesting feature from patient rooms in the Medical Center. Provide feasibility assessment for expanding and existing Spinal Cord Injury/Disorder building in VA Long Beach Healthcare Center, Building # 150 to meet both the future growth of patient care and to provide a Dedicated Therapy Pool area for a minimum 2,000 SF pool and /or resisting current “Hydroworx” pool(s) with male and female dressing rooms, toilets, showers and SPA amenities (lockers, benches, towel/blanket heaters and heated body-blow dryers, etc.). Our scope of work include conducting staff interviews, meetings/minutes, site visits and the preparation of Feasibility Assessment and other related reports, technical information and services.